Chriss Rainey wrote that it might not always be a good idea to take large numbers of flowers to a show. I do know of one or two cases where a local group was so unhappy about visitors winning all the awards that they stopped having ADS shows with ADS judges and now do their own thing. In one of these cases, I was specifically told that the reason for seceding from ADS-sanctioned shows was the visiting flowers. The sad thing is that if they had just said something, I am sure the visitors would have used some restraint. In general, though, I think long-established groups would be disappointed if visitors did not arrive with carloads of flowers to make their shows as big as possible. My suggestion is that if you are going to a show sponsored by a new or small group, just ASK! I’ve been interested in this debate but having been chastised for daring to express views on some aspects of American Shows – eg. non judging of mis-named or unknown flowers I probably should not comment on this issue! However, I am an insatiable magnet for criticism so I will risk a few remarks. 1) Shows are (or should be ) organised to put on as big a SHOW as possible for the visiting public, illustrating the best daffodils that exist. Therefore I think everyone should be encouraged to bring as many GOOD flowers as possible – from what ever distance. 2) This implies, quite rightly, that shows are not PRIMARILY or at least SOLELY for the self- gratification of exhibitors however important the competitive classes might be. If Competition was the Primary purpose then Shows would be called Competitions. My simple view is ‘Welcome all comers – make the show as big and impressive as possible. The locals might be stimulated to upgrade their stocks and compete with the best. In N. Ireland e wellcome amd encourage all to come to every show – otherwise we would have some pretty poor displays. Indeed we consider it a compliment if top exhibitors fro a distance come to our shows. Lets be open and expansive rather than closed and restrictive ! I agree with you Brian. I too have seen shows with locals only classes. Some have beginner type classes. Judging to a standard means the competitors and those just there to see the pretties would benefit from seeing the best possible examples of the standard. Otherwise the fancy, whatever it may be, will be dumbed down and everyone loses. I agree with you, Brian. But I think where the conflict comes in is when a small local garden club decides to have a flower show. Then they have a daffodil section or just make it a daffodil show. And they have trouble getting past that little local show to a bigger concept. The trick is to encourage without discouraging so that someday they are a new daffodil society and putting on the kind of show we want to see. But when they are small, new, and don’t quite know what they are doing, the big exhibitors and all the judging rules just scare them off. I may be new to daffs, but I am not new to clubs and exhibiting, and that in quite a few countries. I have had many interesting experiences at shows! Still do, even though I no longer exhibit. To get to the point, I agree fully with Brian as to the current closed philosophy of many shows. After all, what is the reason to put on a public show? To interest the public! NO OTHER REASON! If we are only interested in garnering prizes, then the shows would not be public, now, would they. It is considerably costlier to stage a public show, than to simply bring the flowers together and have a judging team do their job. As far as prizes going to outsiders, this is easily handled via different classes, plus, I will admit I know quite a few exhibitors that are so prize hungry, they will show their exhibit in a public toilet to get another knic-knak for the cupboard. It is often shameless and, IMO, lies more with a psycological problem on the part of the individual, rather than any need to inform the public! It is much too common, in both senses of the word. Nuf Said. As I mentioned above, I no longer exhibit anything other than fotos of my creations. (I breed parrots, canaries, Hemerocallis, Iris, as well) The main reason is the ridiculous amount of rule and regulation involved, coupled with a certain close-mindedness as to what is beauty, achievement, moving foreward. I have never felt any need to prove my wares to others, they are what they are and represent my personal work and direction, on the other hand, I do not appreciate ridicule in the place of criticism, especially behind the back. In other words, most clubs tend to become friendly little cliques, or lead by one in any case, rather than places to exhange ideas and info and set new goals and standards. Rules are there to be broken! I’ve watched all too many exhibits being down-pointed for what I see as ridiculous criteria in the judging tabelle. In the end, why do we actually involve ourselves with our plants. Because we love them, they fascinate us and offer us a personal challenge. There is not only a sense of achievement involved, but a spiritual feeling that simply lifts the soul, a feeling all to often missing in our modern world, suffocating under a yoke of rules and regulations and expectations. To take this intrinsic joy away from the gardener and replace it with rules and regulations that limit their abilities to create, explore and, very important…share, we are simply cutting off our noses to spite our face. We are not allowing our clubs and societies to bloom. I think you all realise, this is not a call to drop all judging criteria or other such sillieness, it is simply a call to rethink why our clubs exhist and where we wish to go in the future. Who are to be the members that will carry the torch in new directions, if not those we have yet to meet? Without well placed stepping stones, such new members will never cross the stream to take part. It bwecomes just too much work for little or no reward (and I do not mean prizes!). and all the judging rules just scare them off. Maybe your ‘Rule Book’ is too big !? Whenever I arranged a show of any type (flowers or otherwise) I got the judge to take some scheduled time and go over what she was looking for when judging, that is, the rules and how things should look. People were excited to come and listen to the presentations and the following year one woman whose entries had been little childlike and totally incomplete came back the following year and won blue’s. It was amazing. In your note below, you said you were an insatiable magnet for criticism, well, I’m probably a magnet for making a fool of myself and I should never get into a discussion involving numbers, but I’m going to risk all and do it anyway. I’ve just done a Wikipedia search for our two countries. Northern Ireland has 5,345 square miles. The United States of America has 3,794,101. We are 709.84 times bigger than you are. What works for you isn’t always going to work for us. Doing a Google Maps search for your country and plugging in Omagh, your home town, which happens to be pretty much in the smack middle of your country, I find that you are no more than 1.5 hours from any of the shows held each year in Northern Ireland. …I realize sometimes you get delayed when the sheep block the road, but I think I’m pretty close to the truth in my estimate. On the other hand, let’s just take Dallas, for instance, because it is also in the smack middle of this country. If Rod Armstrong wanted to drive to the nearest show to him, which would be Conway, Arkansas, it would take him 5.5 hours. The next closest is probably Jackson, Mississippi, which is 6 hours and 45 minutes away. Those he considers doable. BUT, if he wanted to drive to one of our most eastern shows, Nantucket, Massachusetts, he’d have to travel 1,831 miles and time it just right, so he was there in time to catch a ferry, in time to enter his flowers. If he went to one of our western most shows, Livermore, California, he’d have to drive 27 hours, or 1,692 miles. Now, of course, Rod’s case is extreme, and many of us here in the USA are very fortunate to have to drive only 2 to 4 hours to shows we consider “in our area.” But not so for many many people in this country. I’d guess most of the exhibitors in your country exhibit in all or nearly ALL of the 8 shows you hold each season. Even if American exhibitors WANTED to exhibit in most of our shows, it would be physically impossible. In spite of our vast geography, many of our shows are quite small and have only a handful of loyal exhibitors. The great distances between most of our shows keeps it that way, since it is expensive and very time consuming to travel to very many shows much more than four hours from our homes. Except for those of us who have had the good fortune to belong to the ADS and travel around to national shows, a large number of our ADS members will never come face to face with each other. Which is why, we tend to have shows that develop “personalities” and styles of their own. We think this is a good thing, because our members have adapted and adopted what works best for each area of the country. Now, having said all this, I would like to move on to your note below and add a few comments of my own. Brian: Instead of soccer, Chriss could have used golf – it’s a good thing they kept score at Pebble Beach. I enjoyed that final round drama and presentation as much as any. Will Graeme McDowell now be knighted? Send him a selection of your best bulbs. Chriss: Your use of numbers was fine. Pick any region west of Indiana and consider these matters: Can one attend all the shows in our region? Can we get enough ADS judges to attend each show in the region? If we schedule a regional meeting will anyone come from out of town? How does the ADS mentor an enthusiast and potential member in the reaches of our region? And, of course, is it possible to get the flowers together at the right time, put together a good collection, transport it to a show in a reasonable time, _and_ win a blue ribbon? The answers to these and related questions are heavily dependent on weather and geography, the positive responses being weighted to the east. 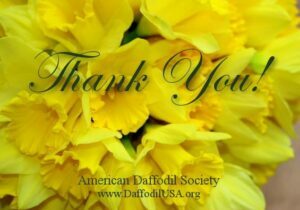 As Chairman of the American Daffodil Society Convention, March 11 – 13, 2011, at the Hilton Jackson, Jackson, MS, I do encourage all potential exhibitors at this show to bring all the daffodils they can and to make all the entries that they find possible. The national show is a big event, and we want your flowers. Although this show is months away, I am already fielding questions about receiving daffodils sent ahead by air freight by exhibitors rather than their trying to fly with them to Jackson.. Thus, the tentative plan is to pick up daffodils sent by air freight at the Jackson International Airport air freight facility and transport them to the hotel on Thursday (March 11, 2011) and then store them in the hotel’s produce refrigerator where they will be held until the exhibitors arrive. Of course, there are details to work out. Nonetheless, it is our plan to accommodate a large number of entries. To that end, we have had many new properties made for the show and are in the process of acquiring the additional needed glassware. So, bring your daffodils to Jackson! We want you to do so!! Is this where I should say ‘OUCH’ again? I admire your geographical research but the point I tried to make had nothing to do with Geography – it was simply to do with giving a warm welcome and appreciation of ‘outsider’ exhibitors coming to our daffodil shows. In some ways you enhance my point – the greater the distance and the greater the prestige of the visiting exhibitor then the greater the compliment to local Show organising committee. I well remember when Tom Bloomer first came to the little Omagh evening Show -The flowers he showed, his influence, his example, his advice and guidance are still felt 48 years later and the show still runs, probably all because of that visit. What if we had said – “we are only a small Society and want to retain the prizes for our members? So let it be. There are no winners in such debate. PS. We may be small in Northern Ireland – but sometimes we punch above our weight – just think of Pebble Beach on Sunday – it was worth staying up until 3am!!! Wait for the ddaffodil name to commemorate! I agree with Brian especially as visitors like Wilf Hall bringing such beautiful and unique seedlings to our little show each year encourages us to keep going. We in New Zealand are enjoying the unusual position of having a team in the current World Cup Football competion so , like Northern Ireland, “We may be small… but sometimes we punch above our normal weight!” The Australians are now calling the Kiwi All Whites, Australasians so that they can share our experiences too. Nicely put reply,said with dignity and without sarcasm. Living in the furthest north growing zone of any ADS show physically prohibits me from taking tons of flowers to shows other than Minnesota’s. (I did take 2 Div 6s to Chicago and got trounced by Nancy Phipuff and Edie Godfry.) However, I love going to other shows as a non-exhibitor. I find I am able to help “locals” with things that would detract them from staging their own flowers for the show. Little things like getting water and tubes, carrying staged flowers to the table setting up signage and the ADS posters can allow a few more blooms get in the show. Additionally, you get to meet a lot of nice people who may never make it to a national convention but do contribute much to the daffodil world.Additionally, you renew friendships with others who dogo to conventions.